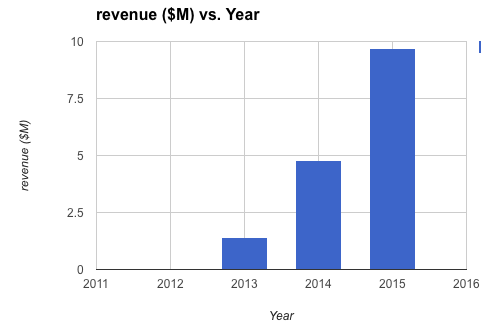 Revenue growth: I thought the bioresearch division's early revenue growth would continue. Management projected a "near double" in revenue and "substantial progress toward profitability in 2016"
At the time of my first post the stock was trading at about $0.30 while it's now around $0.70. From that point of view it has been a smashing success and I feel this is just the beginning. I think we're going to see much higher prices in the years to come. I don't know what price but if things continue it'll be $5 before you know it. When I first found HEMA it was incredibly cheap just when thinking P/B, P/cash, P/NCAV; it's no longer as cheap in those metrics and has moved into cheapness relative to growth and sales. Let's take a deeper look. Overall the company has followed through. They completed the apheresis division sale for $4.6M. They met the revenue projection, posted reports as promised, and have put out a lot of general press releases. It's nice when a company does what they say they will. I wrote my post on Aug 11,2015. HEMA posted their 2014 annual report and 2015 first half results on Sept 21, 2015. The 2015 full year results came Apr 11, 2016. A full audited 2015 annual report and proxy went out to shareholders at the end of Apr 2016. The full 2015 report and proxy have not been posted to their website and I don't know why. I asked management but got no reply. It's like they feel they must post something but want to hold back what they can. I don't get it but I'll go through some highlights below. Another strange thing is the company took down the 2014 annual report when they redid their website. The new site came around the beginning of the year and looks great. Management tells me this is because the new CFO (more on that below) wanted to start fresh. 2013 and 2014 included their old divisions outside of bioresearch; I'm told they want everyone focused on the new business so they just pulled it. I have a copy if anyone out there has a specific question. A few PRs were released discussing broadening Hemacare's reach. They can ship anywhere in the world. Their special packaging and process ensures the product stays good for 10 days. A lot of PRs were released highlighting trade shows and panels they've attended. At the annual meeting management talked about the importance of these. This seems to be a big part of their marketing. This is where it gets interesting. Just look at this graph. The company started the bioresearch division in 2012 from 0 revenue. It has since grown like a weed and shows no sign of slowing down. At the May 2015 annual meeting the company predicted a 'near double' in revenue then revs grew by 102%. I tried to get a prediction with numbers from management for 2016 at the May 2015 annual meeting with no luck. One thing they did say was international business accounted for about 10% of 2015 revenue and they expect that to double in 2016. A PR in Oct 2015 noted "HemaCare’s market penetration continues to accelerate." 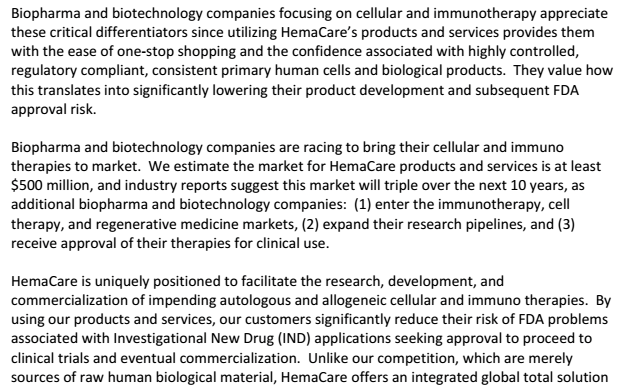 One line from the CEO letter from the 2016 annual report says HemaCare's revenue growth will "further accelerate". At the May 2016 annual meeting the question of growth and numbers for 2016 came up and the CEO said he expects the "same growth". Those are some pretty strong statements there. Taken literally those point to 2016 revenue of $20M or more. That would be amazing. To me the "same growth" would be another double but who knows exactly what the company means or what will really happen. Maybe they are wearing their salesman hat and reality is more like "some growth." If we run out the $20M revenue at a 45% GM (it'll likely be higher) plus $7M SGA (more than current) and 30% taxes (which they may not have to pay) we'd get an EPS of $0.13. What would you pay for a company doubling revenue in a growing industry with 13 cents earnings? Maybe $1.50? More? Supporting the idea of further growth are the changes from 2015 first half to second. Loss from operations dropped from $0.8 to $0.6M while revenue increased from $4.3 to $5.4M and GM expanded from 43 to 48%. One thing that disappointed me about the 2015 numbers were no profits. At the May 2015 annual meeting the company did not predict profitability but rather "substantial progress toward profitability" and I know that but still I was hoping for more. The problem is I underestimated SGA. I thought it would stay around $4M when in actuality it jumped up to $6M-ish as they transitioned to bioresearch. One good datapoint is SGA dropping from $6 to $5.8M from 2014 to 2015. Again I will say that I'm looking for profits at the end of this year. I'd expect SGA to increase as sales grow but hopefully not as much moving forward. I attended the annual meeting a month ago. It was pretty interesting but unfortunately I was not able to get any numbers. The meeting was myself and two other investors plus the entire board in one little meeting room. They had a BOD meeting after ours. Margins have improved as the company has shifted customers into products that require more processing. So rather than just taking samples and shipping they must have scientists do something to the sample first. Management expects this to continue toward higher margin products. The CEO expects the "same growth" in 2016 as 2015. They are expanding their sales force and products. They do not anticipate a need to expand facilities at this time or raise cash. They do see the possibility of remote collection centers around the country in the future. Overall things sounded very positive. The board is smart and executing their vision. Margins are improving and will continue to do so. Their number of products is expanding as is their customer base internationally. One thing I wish I knew was inside ownership. I've asked for it several times and have been told not to expect it until they file again with the SEC. What can you do. I bet the board is over 50% now and maybe higher but that's not based on any evidence. They are non-reporting so we won't know until they choose to disclose it. I think departing board members sold and new board members have bought at rock bottom prices over the past few years. One interesting item here is the new CFO. I had a call with the CEO in Jan 2016 and he mentioned her more than once. Prior to this there was no one above the controller level. He stressed this CFO has "extensive experience" with SEC reporting companies. To me that means he is getting prepared to file again when the time is right. The current board is listed on the company website but not in the annual report. The last time the board was listed in a report was the 2011 10K. At that time the board members were (ownership in brackets): Gerber (13.9%), Sligh (1.5%), Steffenhagen, (4.4%) Van der Tuck, (8.5%), and Van der Wal (3.4%). Then there were some five percent owners Wolf (9.7%), Egan (7.5%), Avidar (6.8%, Boston Ave Cap (5.4%). They also had listed a COO and CFO. In August 2015 when I first talked with the company the CFO was gone. In Jan 2016 they had hired a new CFO and the VP of finance I had talked with in August was gone. Now the board is Gerber, Van der Tuck, Van der Wal, Avidar, and Wolf. So on the board they got rid of two lower owning members and brought in two of the 3 biggest outside stock holders. The two new board members came in 2015. Going by the 2011 numbers the board would now hold 42.3% of outstanding common but I think it's higher. One interesting thing is the new board member Avidar's job title, "Independent Investor." This all sounds good to me. They have new CFO ready to file with the SEC. The board now has higher ownership and one member sounds like simply a large shareholder. The chairman and CEO have not changed. Like I said the company did produce an annual report. The most exciting thing in there to me was the CEO letter. Other than that the numbers were already given in the year end PR. It was audited without issue. The main thing missing is inside ownership. HEMA is cheap. They went dark to completely change their business model and have done so. They've now started posting numbers again and the growth is amazing. They expect the growth to continue and when coupled with their increased communication I think the share price will be moving up. My portfolio is up to about 23 stocks now. I have moved away from concentration and think the 20-30 stock range is about right for me. Most stocks are a few percent of my portfolio except for HEMA. I have been a steady buyer up until Fidelity decided to block me from all dark companies. HEMA is now probably a third of my portfolio. When making a stock purchase I always compare to what I already own and HEMA is one of those companies that has continued to look better than just about everything else. There are companies cheaper on an asset basis (ADDC) and maybe when thinking of only now (COMX) but HEMA adds in the coming back from darkness aspect. With HEMA I can see why they went dark and it seems they are emerging from that. If revenue growth continues and they keep moving towards the light, look out. Any update on HEMA? I've been recently buying up HEMA. They posted numbers for the first 6 months of 2016. The rev has increase to $5.7M. Definitely not the $20M run rate but I think they signed more distributor agreements in second half of 2016. I would think their growth rate increased in second half, but we will have to wait to see. when and where is the annual meeting? also, how do you know the report is out in April? Annual meeting will be at their headquarters in Los Angeles. For dates I assume it'll be similar to last year when they released annual numbers on Apr 11 and held the annual meeting May 12.
are you planning on going to the annual meeting? I will likely make it out there, unless work stops me. at a fixed price per share. The first closing for $2.5 million occurred on January 6, 2017, with the issuance of 727,572 shares of the Company’s common stock. The second closing for $1.25 million of shares will occur, at the option of the Buyer, on or before December 31,2017, and the third closing for $1.25 million will occur, at the option of the Buyer, provided that the second closing occurred in full, on or before December 31, 2018." This means they've diluted shareholders to raise $5 mil right? On the other hand it seems OneBlood thinks HEMA stock is worth at least $3.44, after dilution, and presumably OneBlood knows more about HEMA than you or I. And HEMA has raised a bunch of cash without taking on any debt. To me this is a major win. Yes there are more shares outstanding now but look at the positives. At the time OneBlood was buying shares for $3.44 the stock was sitting at $0.65. Thanks, what did you think of 2016 results, and what's your take on the current valuation. Certainly nice growth rate but nowhere near the rate of previous year. There are now about 11.4m shares outstanding at $2 that's a market cap of 22.8m if we deduct cash on hand of $4.8m after the stock sale we get a EV of $18m. EBIT seem to be at $800k this gives us a EV/EBIT of 22.5 this years numbers. If we look to next year and assume 25% increase in revenue and earnings we still get an EV/EBIT of 17.5. Obviously EV/EBIT isn't the only way to value a business so I'm wondering what your take is on it. Thanks and congrats on a great find. I don't know about valuation but I would say you can't separate operations from the great capital raise when thinking what the stock price should be. It would probably take a stock price of $4 for me to really think about selling, depending on the news. We may have a pullback for sure but to me all signs point to this stock going higher. They are doing everything they said they would and why shouldn't it continue? Have they saturated the market? Is the market opportunity going to increase or decrease? They are expanding, they are signing new distribution deals, they are increasing capacity, they are doing good on communication, they are figuring out how to get their product into as many places around the world as possible. If the stock were to spike up to $5 tomorrow I may sell some then buy on the pullback. Otherwise I'll just wait and see how it goes. I'm eager to hear what management has to say at the annual meeting. "They are doing everything they said they would and why shouldn't it continue? Have they saturated the market? Is the market opportunity going to increase or decrease? They are expanding, they are signing new distribution deals, they are increasing capacity, they are doing good on communication, they are figuring out how to get their product into as many places around the world as possible." I think you hit the nail on the head with this commentary. If they are going to grow at anything close to 25% a year for the next 3-5 years then this is certainly not expensive, I can even see them getting taken out at $4-$5 a share based on 2016 results alone. I guess I'm trying to get some clarity on those questions. Have you found anything regarding size of market, or competitors. How big can sales grow to? I'll try to do some more research and report if I find anything helpful. receive approval of their therapies for clinical use." Management told me AllCells was their main competitor a while back. I'm not sure of others. One thing I wonder is what it would take for another blood bank to replicate what HEMA is doing. Regarding valuation you have to consider the $800K was really done in 6 months. In the first half of 2016, they were negative 80K. So w/ the growth the 12 month run rate is around $1.6M+ of net income. plus these guys are in a market where there is huge operating leverage. so increamental revenue will have big impact on bottom line. plus NOLs to protect the income. so i think any valuation has to consider all this. as for revenue, you have to realize the OneBlood deal is huge for the company. and that hasn't even come in on the results. so revenue will increase and grow. the 50% growth last year was without OneBlood, the israeli distribution, and the international distribution via OneBlood. so i wouldn't be surprised if they do 50%+ in rev growth in 2017. Does anyone know hoe many donors are currently enrolled? I.e. how good is the increase of 750 donors in the last press release? Which press release are you referring to? I don’t know how many donors they have. Happy holidays greeting message sent to shareholder dated 20Dec17 with "750 new donors" ebing the only part of the text highlighted in italic... must be significant otherwise why bother? Would you consider buying at this price or are you holding for tax considerations? I don’t think I’d buy at this price and taxes don’t figure into my thinking.